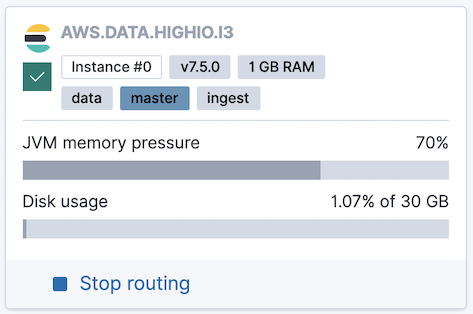 In addition to the more detailed cluster performance metrics, the Elasticsearch Service Console also includes a memory pressure indicator for each node in your cluster. This memory pressure indicator can also tell you when you need to think about upgrading to a larger cluster. The percentage number used in the memory pressure indicator is actually the fill rate of the old generation pool. If you want to know about why we chose this metric, see Understanding Memory Pressure. At 75% or less the indicator is grey and the garbage collector is idling. This means that there is likely some garbage among the allocated objects, but there is no way to tell until it reaches 75% and the collector starts. Above 75% the collections start and become more frequent as it approaches 100%. When the memory pressure reaches 75% the indicator turns yellow. A significant amount of cpu is now spent on garbage collections and the memory pressure is now likely affecting the performance of your cluster. As long as the performance suits your needs, a memory pressure above 75% is not a problem in it self, but you don’t have much to go on. Our recommendation: monitor the situation and try to reduce the memory usage or consider upgrading the cluster. At 85% the indicator turns red. The instance is now not only close to running out of memory, but the likelihood of long garbage collection pauses is increased. Both of of these can harm the stability of your cluster and the integrity of your data. Unless you expect the load to drop soon, we recommend that you now upgrade the cluster. Even if you’re planning to optimize your memory usage, it could be wise to upgrade the cluster first. Not only will it give you more time, but also provide the cluster with more resources for applying the changes. To learn more about monitoring your cluster, see Keeping Your Cluster Healthy.